Hi everyone, Steph Ackerman here today with a new challenge for the Scor-Pal blog. This month it's time to create anything you want. As Christmas is near, I wanted to create a different shaped treat box. This box takes 3 sheets of cardstock and 3 sheets of pattern paper. Step 1 - Using a 12" x 12" sheet of cardstock, score at 4" and 8". 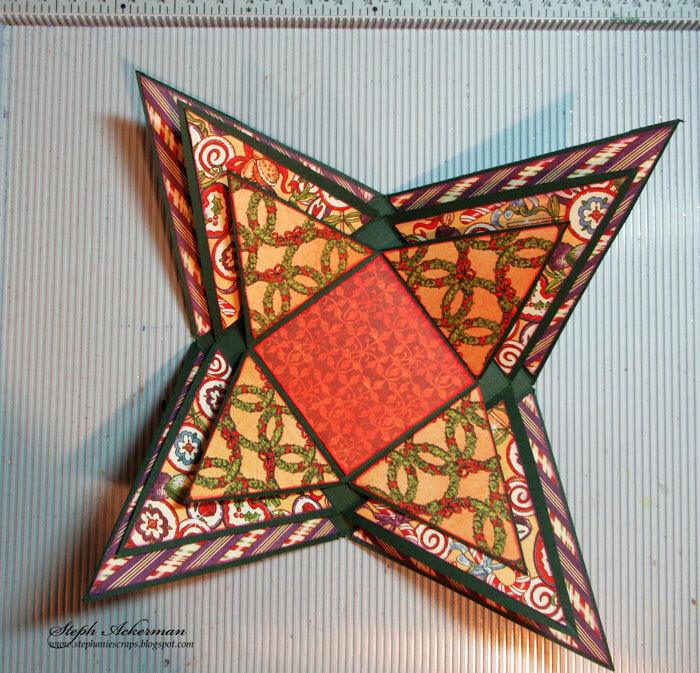 Rotate and score again at 4" and 8", creating 9 equally sized squares. 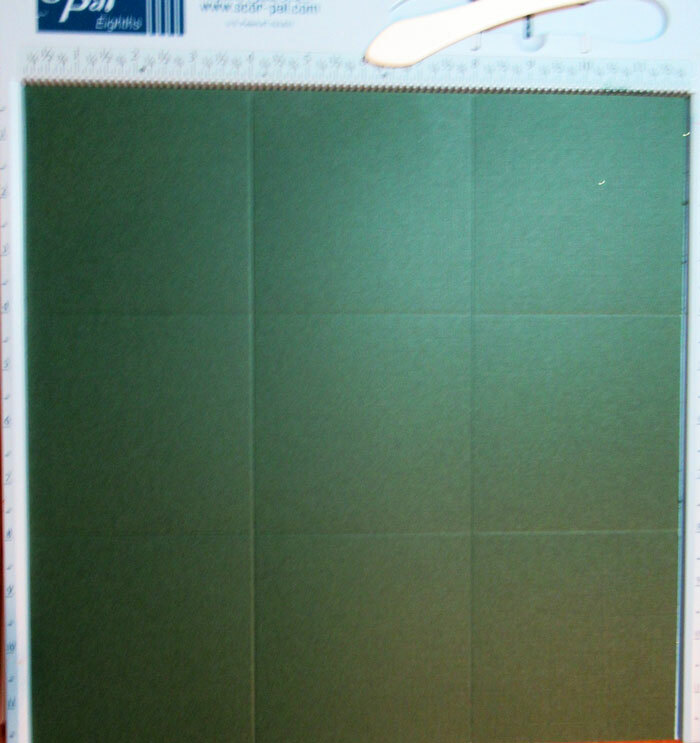 Step 2 - Cut 2nd sheet of cardstock 10 1/2" x 10 1/2". Score a 3 1/2" and 7". 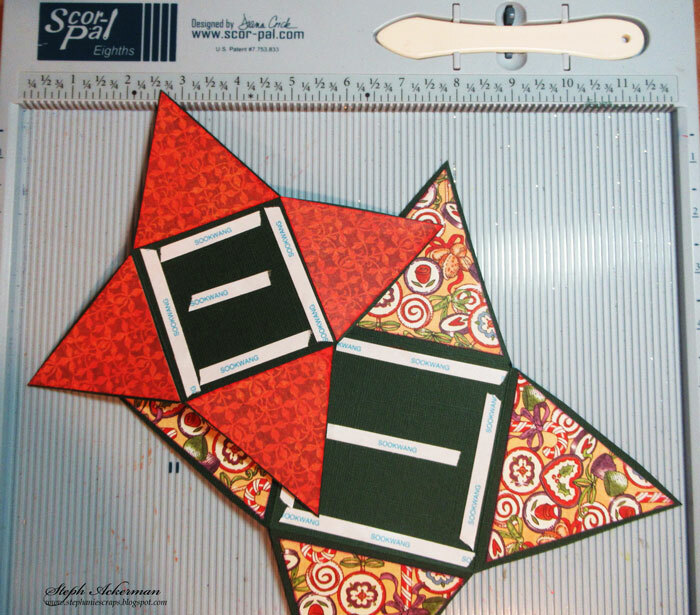 Rotate the cardstock and score again at 3 /12" and 7", creating 9 equally sized squares. Step 3 - Cut 3rd sheet of cardstock 8 1/4" x 8 1/4". Score at 2 3/4" and 5 3/4". 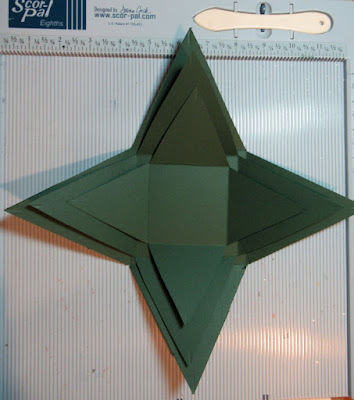 Rotate the cardstock and score again at 2 3/4" and 5 3/4", creating 9 equally sized squares. 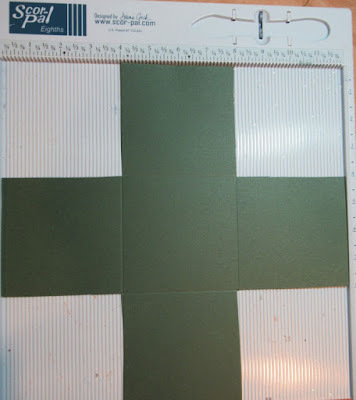 Step 4 - Cut the corners from each sheet of scored cardstock. 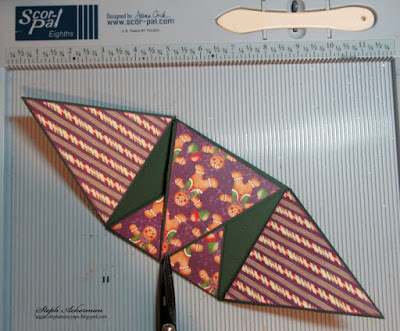 Step 5 - Cut each square into a triangular shape. Find the center of each square and cut on an angle to the score lines. Step 6 - for the exterior panel, cut 8 pieces of double sided pattern paper, each 3 3/4" x 3 3/4". Cut into triangular shapes to fit. Ink edges and adhere to both sides. 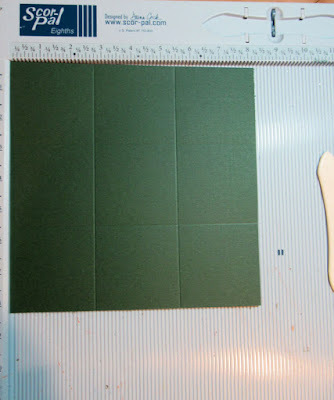 Step 7 - for the middle panel, cut 8 pieces of double sided pattern paper, each 3 1/4" x 3 1/4". 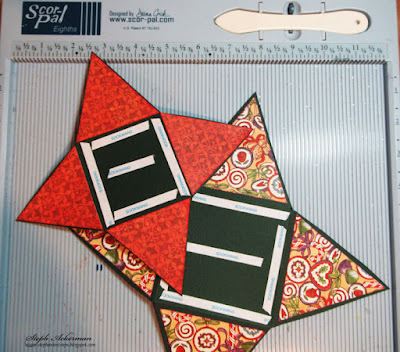 Cut into triangular shapes to fit. Ink edges and adhere to both sides. Step 8 - for the smallest panel, cut 8 pieces of double sided pattern paper, each 2 5/8" and 2 5/8". 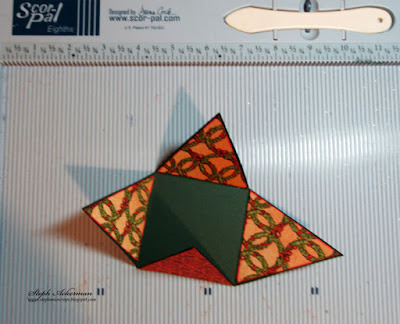 Cut into triangular shapes to fit. Ink edges and adhere to both sides. Step 9 - cut a 2 5/8" x 2 5/8" panel to fit the center of the smallest panel. Ink edges and adhere. Step 10 - add Scor-Tape to the center panels and adhere all 3 panels together. Step 11- Punch holes in the center of the larger panels and thread ribbon. 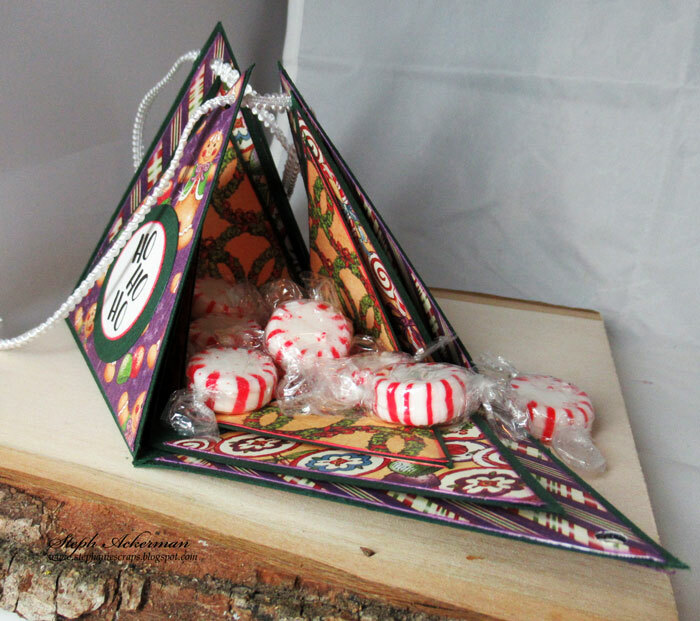 Place candy inside. Stamp phrases on white cardstock. 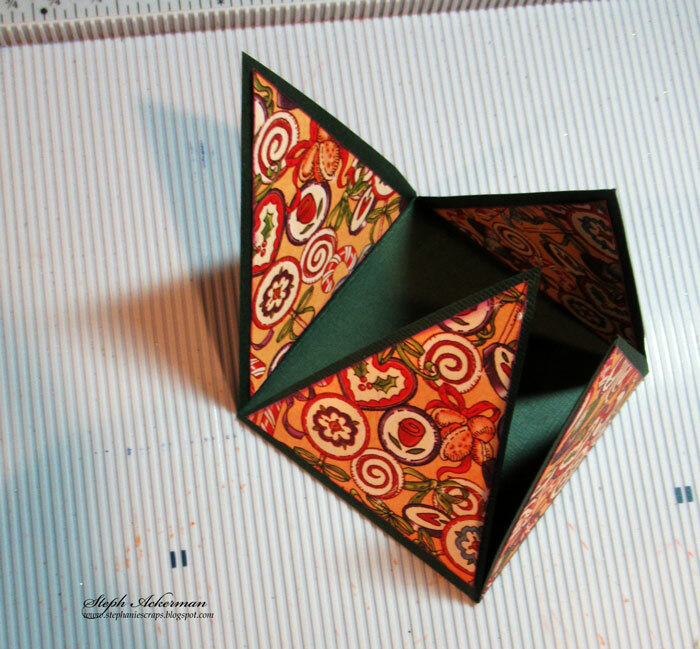 Die cut, ink and mat with larger dies. 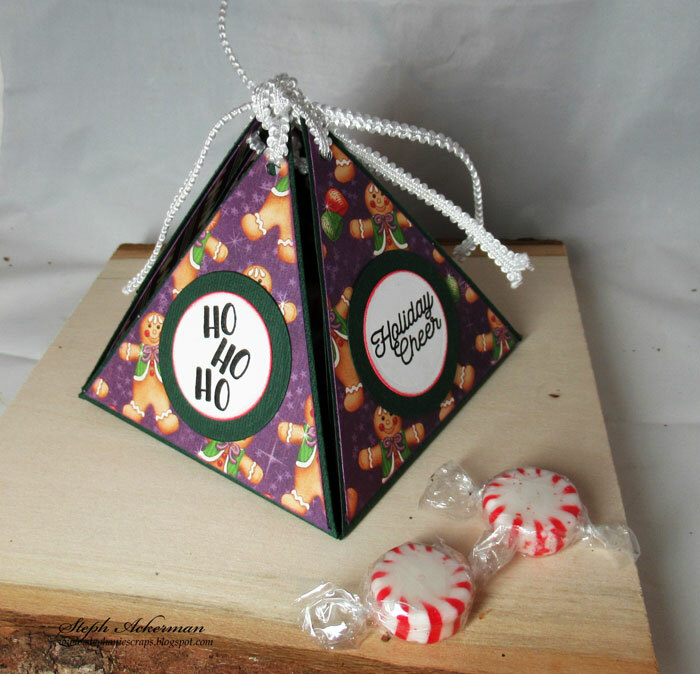 Use a hook to hang from Christmas tree or even use as a place setting on the dining room table.